Virginia civic activist Brian Wheeler launched an unusual local non-profit in 2005. Christened Charlottesville Tomorrow, it focused on planning and land use and attendant business and environmental issues. But Wheeler’s group did not have a point of view to advocate. Instead he envisioned generating awareness and discussion in the community. Charlottesville has particular characteristics that made Wheeler’s undertaking a fit. It is a university town, highly educated, also with a cadre of wealthy retirees. The surrounding county remains 95 percent rural. Four years later, Wheeler found himself in conversation with McGregor McCance , the editor of the local Charlottesville newspaper, The Daily Progress. McCance was staring at a grim number. In just four years his reporting staff had fallen from 42 people to 18. Some worthwhile coverage would have to go or get reduced attention as beats were consolidated. The two ended up with a handshake deal and a two-page memo of understanding. 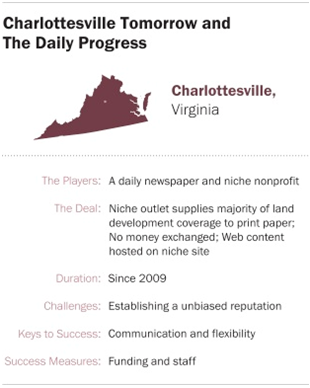 Charlottesville Tomorrow would provide a large portion of the paper’s coverage of land-use and development issues. Money would not change hands (though Charlottesville Tomorrow does get in-kind help as the paper prints its voters’ guides and other reports for free). But the win-win opportunity was obvious. Charlottesville Tomorrow would get much wider exposure for its work. The Daily Progress would get thorough coverage of a subject important to readers that might otherwise have gone neglected. Five years and 1,200-some stories later, the relationship is still flourishing. It has survived a change of ownership, as Media General sold the Progress and other newspapers to Warren Buffett’s BH Media in the summer of 2012. McCance has moved on to the top public information job at the University of Virginia, but new editor Lee Wolverton has seen no reason to walk away from the deal or modify it. Like the original agreement, the mechanics of the partnership are uncomplicated. At the beginning of each week, Wheeler said, he and Progress editors confer “on who’s covering what.” The flexible terms allow Progress reporters to focus on other topics most of the time but collaborate or bring in-house stories they want to be staff-produced. 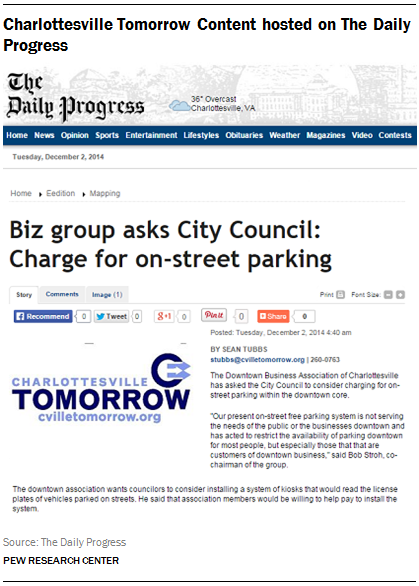 Charlottesville Tomorrow has grown to an annual budget of just over $400,000. More than half of that comes from major gifts from individuals, the balance from grants, underwriting and smaller individual gifts. Wheeler still writes many of the stories but has been able to add two additional reporters, a community engagement and marketing specialist, and some interns—in total then, four reporters plus interns. Charlottesville Tomorrow also repurposes its work in regular podcasts. That amounts to pretty lavishly funded supplemental beat coverage for a small town paper with daily and Sunday circulation just over 20,000. Wheeler said that he aims for in-depth takeouts, and his budget allows for data analysis and elaborate infographics that would be beyond the reach of the Progress on its own. At the same time, Wheeler concedes, “I’d be the first to admit we had things to learn.” Professional editing has sharpened the writing of the material, he said, and the paper’s editors are skilled at cutting to fit (at the same time linking back to the non-profit’s site for a longer version of some pieces). While metrics are not always a part of these partnerships, Wheeler keeps a few. Besides the running story count, he said he determined that just over half the coverage of growth issues in the Progress over a year-and-a-half period came from his organization. And despite continued pressure on news space, the story count in the Progress on the topic has risen from a monthly average of 44.6 from 2005 to 2009 to 48.1 in the five years since the partnership began. Charlottesville Progress publisher Keely Byars said that any bias in coverage would be unacceptable and Charlottesville Tomorrow steers clear of that. Anther check, she added, is that “our community is extremely well-read and intensely interested in local issues” and thus would flag any axe-grinding. It is this last point that makes Charlottesville Tomorrow a comfortable fit for news coverage. But that charter also probably explains why there are so few such local partnerships. Non-profit groups much more often are born of an advocacy agenda—environmental, school reform or social welfare. That makes them better qualified for op-ed page essays rather than basic news coverage. As time goes on, though, news organizations are growing more comfortable using outside contributions with a point of view so long as the facts check out. At the same time, local activists may want to consider Wheeler’s model and consider the heightened impact of putting agenda-setting ahead of proselytizing.